﻿ Newly done? Bernoulli done! A couple of weeks ago a fantastic maths story appeared in the news. It concerned Shouryya Ray, an Indian-born school student living in Germany. Reportedly, Shouryya's entry to a student science competition included the solution to "Newton's 300 year old riddle", an unsolved mathematical problem that had stumped the great Sir Isaac Newton. It was obviously a terrific achievement. Except, the story was pretty much nonsense. Surprisingly, it seems that it was the reputable Die Welt that started the whole thing. And of course, once a silly story enters the News Limited system, it will be broadcast far and wide. None of the many reports contained a single note of scepticism or made at all clear what Shouryya had supposedly achieved. The reports included little more than vague references to "projectiles" and "air resistance". It took some clever mathematical detectives in the nerdy corners of the internet to piece together the real story. Later, mathematicians Ralph Chill and Jürgen Voigt were able to review Shouryya's work, after which they produced an excellent summary of what Shouryya had and had not accomplished. Famously, Sir Isaac Newton clarified the concept of force, in particular gravitational force, and used this to derive Kepler's laws of planetary motion. Closer to Earth, if we throw a ball then it is very accurate to assume that the gravitational force on the ball is everywhere the same. This leads to the familiar model of projectile motion, with the familiar parabolic paths (first determined by Galileo) as solutions. Then there's air resistance. Friction from the air will obviously have a retarding effect on a ball's flight, but there is no simple and accurate model of this effect. It depends subtly on the specific properties of the ball and the medium through which it is flying. Nonetheless, we can still consider simplified models, of which the simplest is obtained by assuming that the air resistance is linear with the speed; in this model, doubling the speed of the ball doubles the resistant force against its flight. Including linear air resistance makes for more complicated equations, but they are not too difficult and Newton was able to solve them. Unfortunately, the linear model does not tend to be very realistic; Newton himself described the model as "belonging more to mathematics than to nature". Generally more useful is the quadratic model of air resistance: in this model, if the speed is doubled then the air resistance increases by a factor of 4. This is the model Shouryya Ray considered, and this is where things get murky. No one knows how to solve the equations of projectile motion with quadratic air resistance, at least not in the usual sense that we think of a "solution". Yes, the equations can be thrown into a computer and some numbers will be spat out, and then, yes, pretty graphs can be drawn: we have drawn such a graph below. 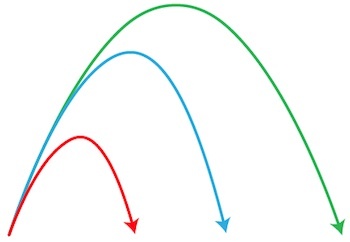 (It's the red curve, together with comparable graphs of the linear resistance model (blue) and the no-resistance model (green).) However, neither human nor machine has been able to derive what mathematicians call a general closed form solution, a simple formulaic solution in the same sense that "parabola" solves the no-resistance problem. What about Sir Isaac? He argued that the quadratic model was physically natural and he worked on the model, but it is true that he was unable to solve the equations. 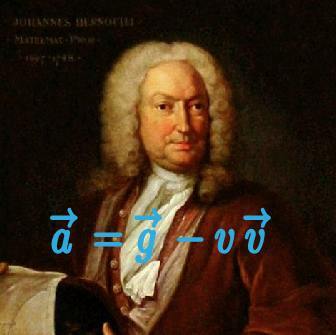 Moreover, Newton's work included a significant error, which was happily pointed out to him by one of his great rivals, Johann Bernoulli (pictured above). And Shourrya Ray? As Chill and Voigt make clear, Shouryya "solved" the quadratic resistance problem in a certain sense, but not in the closed form sense, not in the sense that most people would think of as a solution. Shouryya derived what mathematicians refer to as an analytic solution, meaning it includes a particular type of infinite sum (what is known as a power series). Moreover, though Shourrya's work was clever and (mostly) correct, and incredibly impressive for a school student, his results were neither new nor surprising. In Newton's time such work was tricky, but analytic solutions are not in general difficult to obtain, and such a solution to the quadratic resistance problem was essentially derived by Johann Bernoulli in 1719. So, what should have been an engaging local story about the impressive work of a budding mathematician was transformed into an almighty beat up. It happened because reporters ignored the warning signs, which were there in neon lights. The first warning sign was simply the magnitude of the claim. Yes, 300-ish year old problems do get solved and, yes, young maths students do spectacular work. But it is not common, much less common in tandem, and one expects real evidence to back the claim of any such occurrence. This was all a silly episode, but fortunately the reporting of mathematics and science is not always so poor. When it comes to a major issue such as global warming, news organisations are much more diligent. Then, when it really matters, they appreciate the value of expert opinion, and the importance of distinguishing good science from cultish disbelief. Yeah, right.